Sakurajima Volcano - Visit The Most Active Volcano in Japan! Sakurajima Volcano – Located in front of the city of Kagoshima, Sakurajima is home to one of Japan’s largest volcanoes. With its explosive eruptions, it is the most active volcano in Japan and you will even see smoke coming out of its crater several times a day. 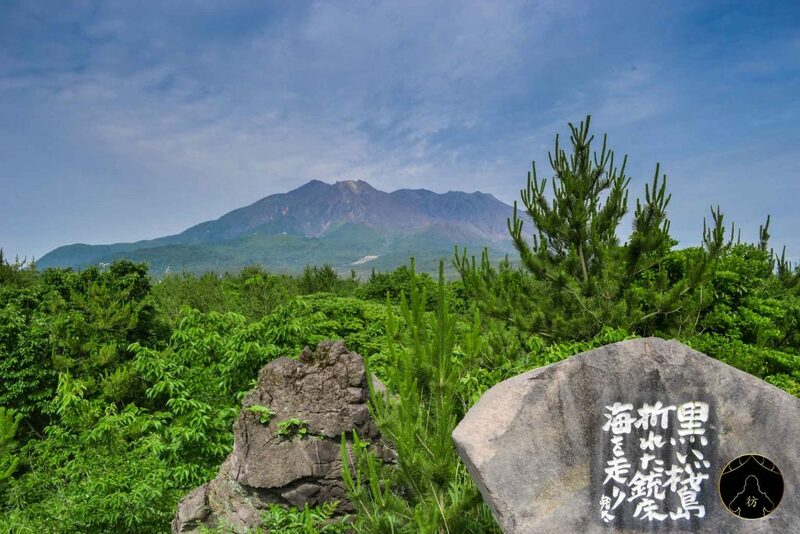 The island of Sakurajima is a beautiful destination where you can enjoy gorgeous landscapes and very hot spring water baths. We’re going to review some of the island’s best attractions in this blog post but let me first give you some tips on how to get to Sakurajima and where to stay. 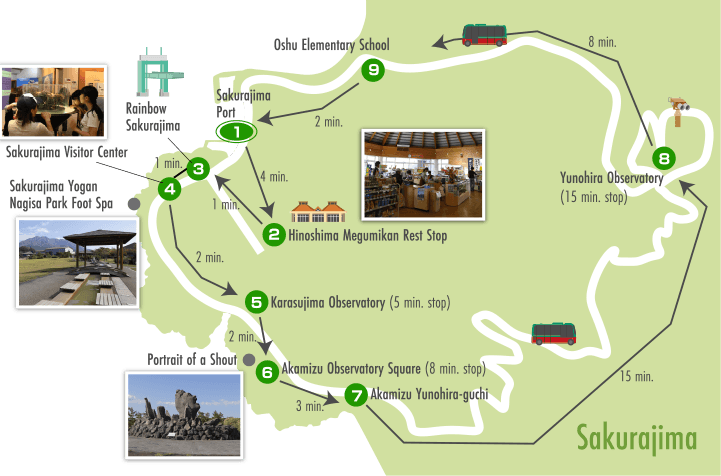 Sakurajima Volcano – How to get there? 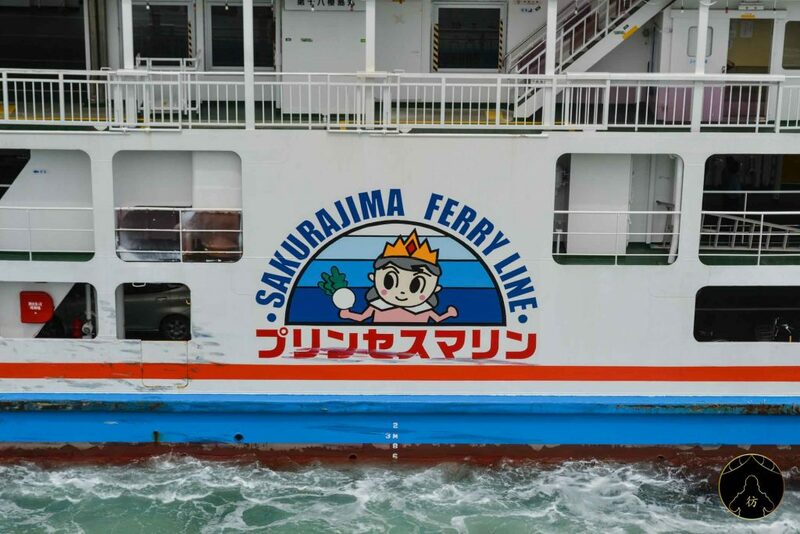 As you can see, Sakurajima is an island, so you will need to take a ferry from the port of Kagoshima to travel the distance between Sakurajima and Kagoshima, which is roughly 3,5 kilometers. The port is located east of the city and here is its exact location. 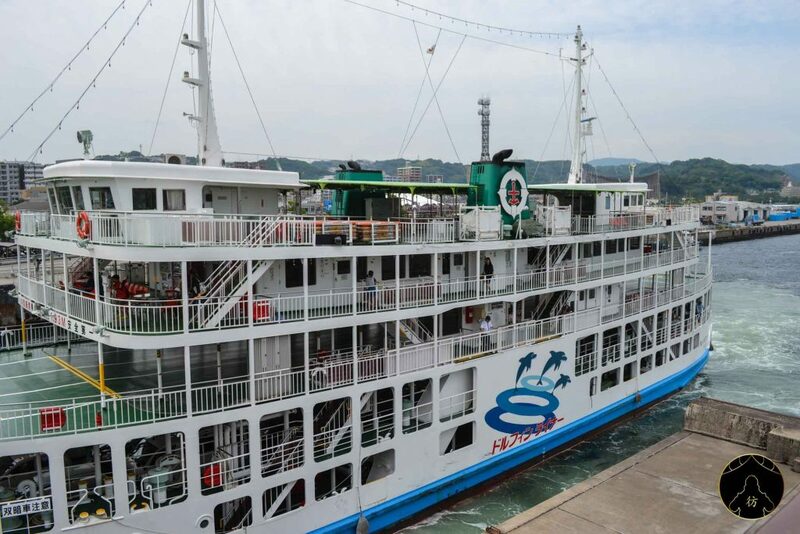 To get there, you can walk 10 to 15 minutes from the JR Kagoshima Station or you can stop at the Suizokukanguchi tram station and walk 5 minutes to reach the port. 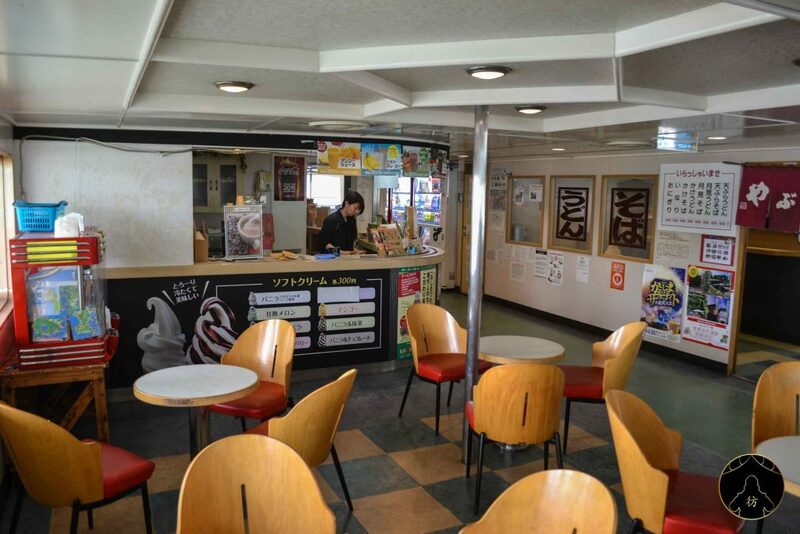 The ferry trip lasts 15 minutes and a one-way trip costs 160 yen ($1.5). All payments are made at the port of Sakurajima. From 6AM to 8:30PM, a ferry leaves the port every fifteen minutes. All ferry schedules are available here. 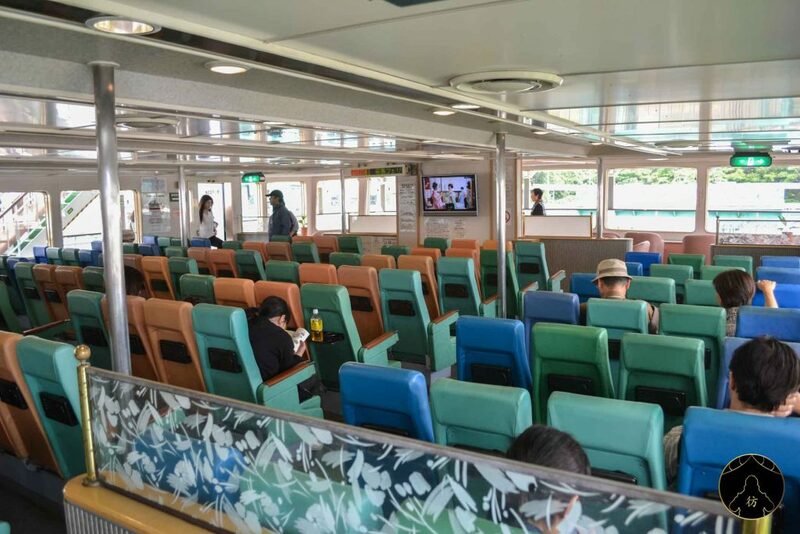 You will be traveling in large, well-equipped boats where you can sit throughout the trip and even buy something from the cafeteria on board. 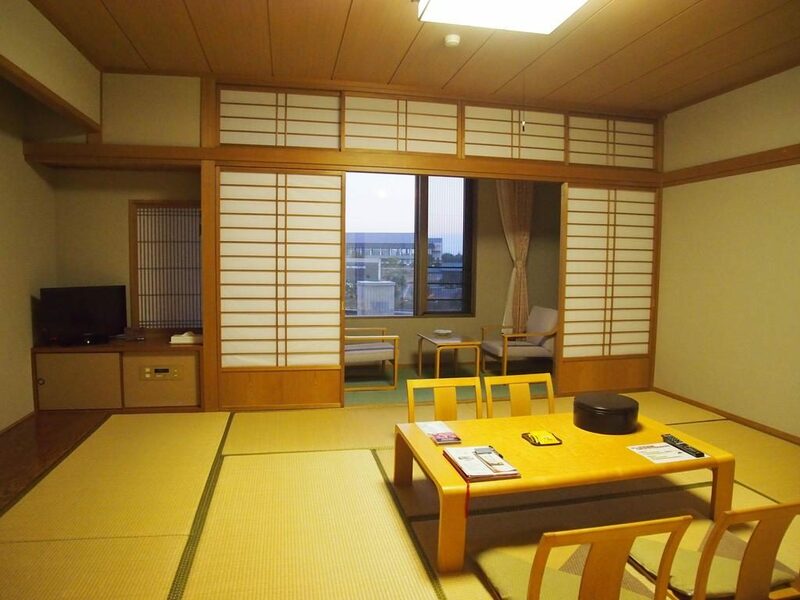 You can stay in Kagoshima and travel to Sakurajima by ferry but there’s also a great ryokan you can try out in Sakurajima. It is called Rainbow Sakurajima and offers a terrific view of the volcano as well as a great onsen. Located 5 minutes away from Sakurajima’s port, Tsukiyomi Shrine is one of my favorite places on the island. Strangely enough, there was no one around when I visited it. 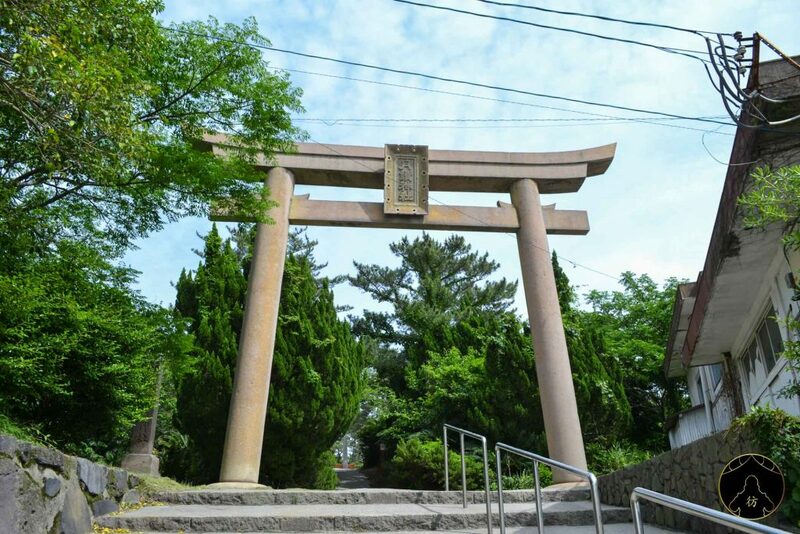 Like all shrines in Japan, the entrance is marked by a beautiful stone torii you can see in the photo above. A torii represents a door that separates the mortal world from the sacred one. 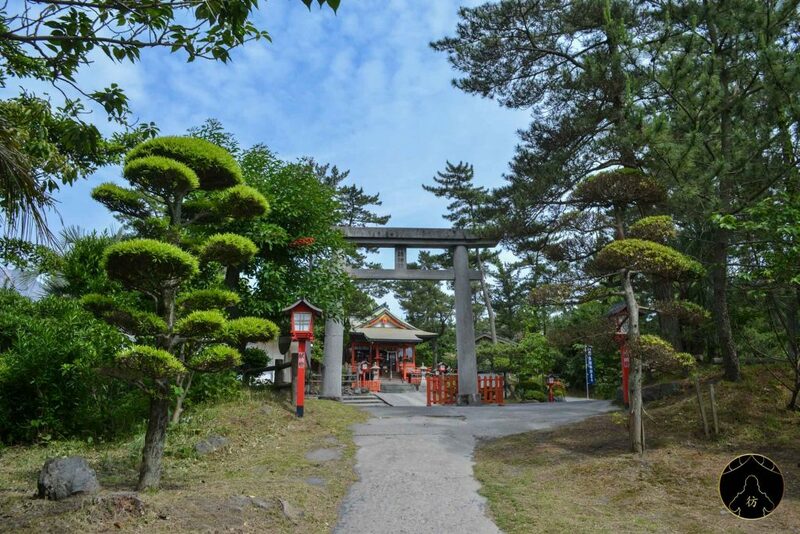 There are a few steps to climb at the entrance of the sanctuary, you will then see another stone torii and a few shrubs here and there, trimmed in the Japanese pruning style. 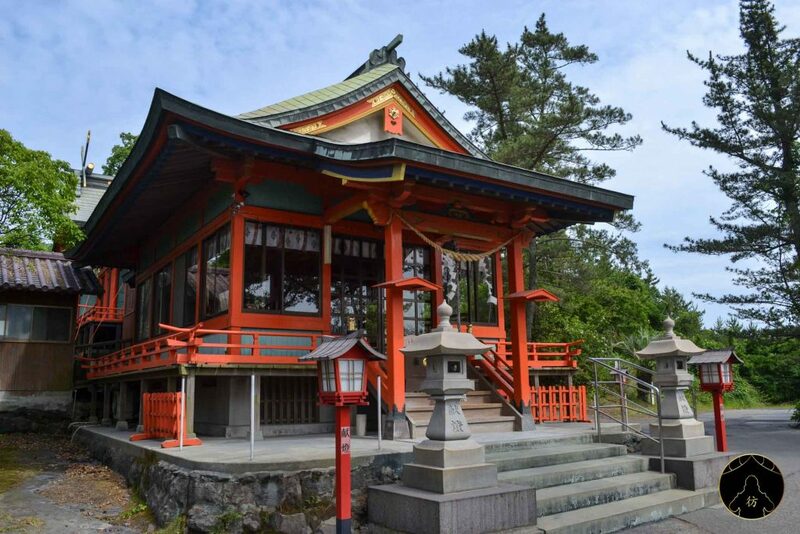 Tsukiyomi Shrine is Sakurajima’s biggest place of worship and locals see it as the energy center of the entire island. I must admit that place has a very special aura about it. 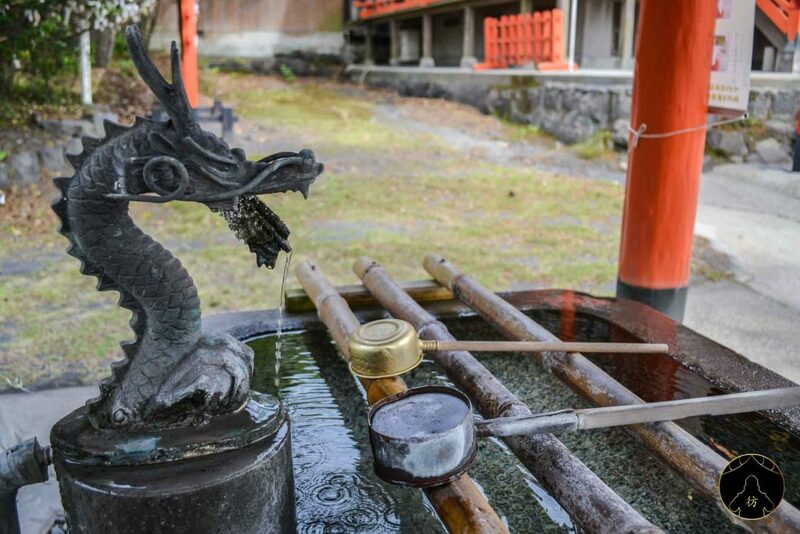 The main building is only a few steps away with a sacred water spring on your left, guarded by a beautiful dragon. This water is supposed to purify you before your prayer, a bit like what ablutions are supposed to. If you look closely, you will notice there’s black dust on the ground and that is actually ash spewed out by the volcano into the air. 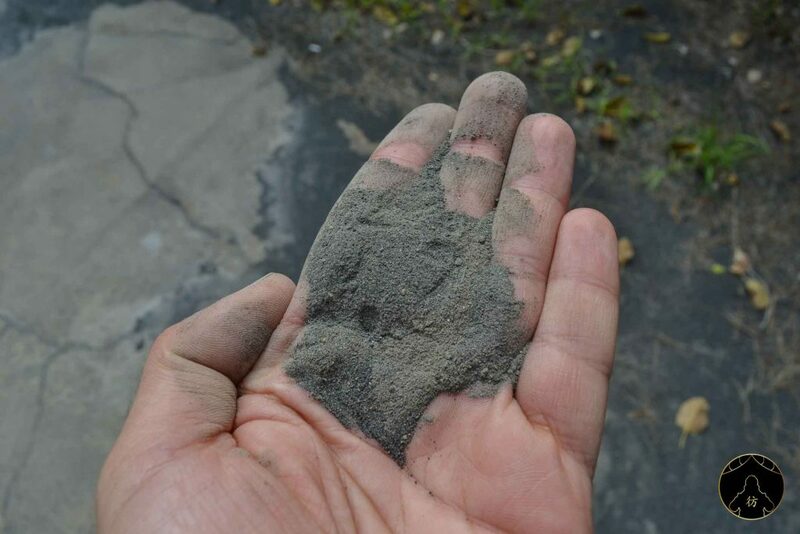 There’s ash all over the island actually. 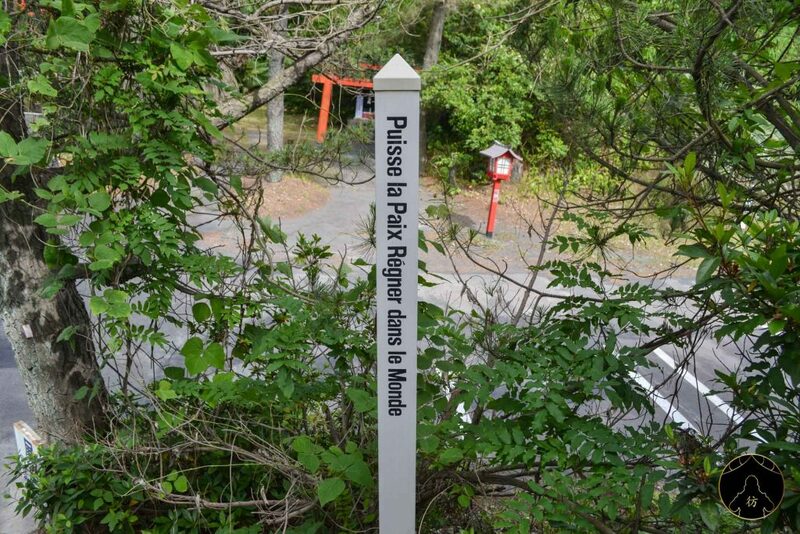 During my visit to Tsukiyomi Shrine, I was surprised to find an inspiring message written in French on a wooden pole. 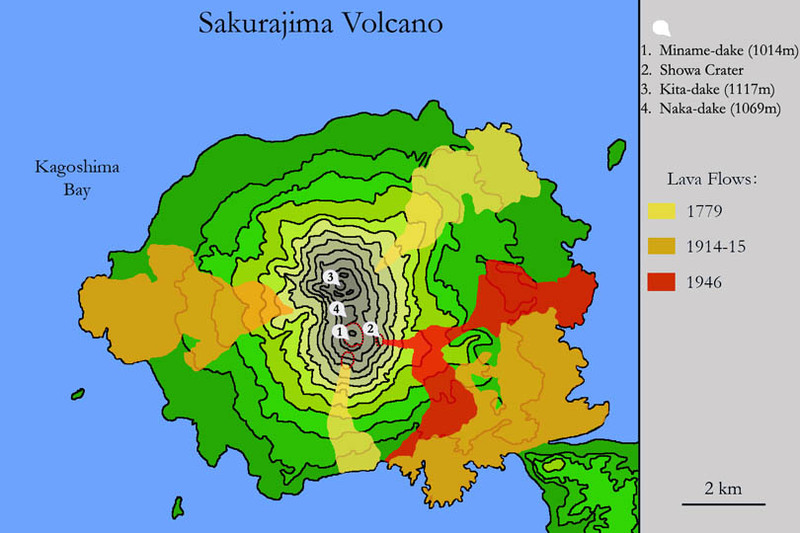 If you ever travel to Sakurajima and find it, make sure to let me know in the comments below! 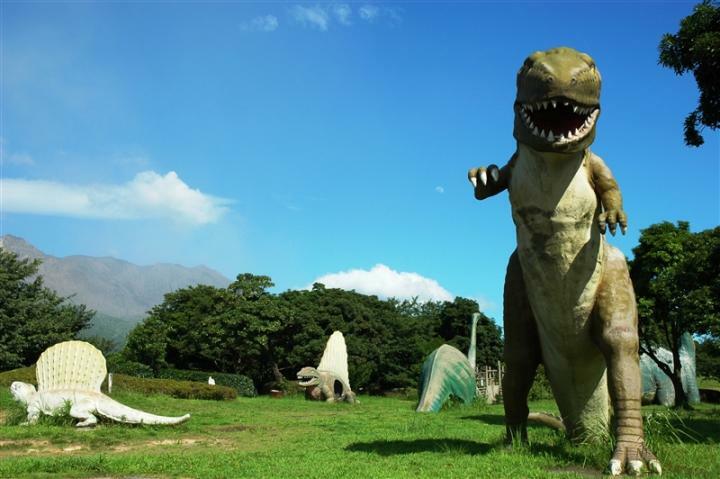 The Dinosaur Park is also within walking distance of the port of Sakurajima. It is actually a theme park that is visited mostly by children. All those dinosaurs in the park are pretty strange so take a look at them but don’t waste too much time there. Walk around the park, eat your onigiri or whatever snack you managed to bring with you and let’s continue our tour of the island. 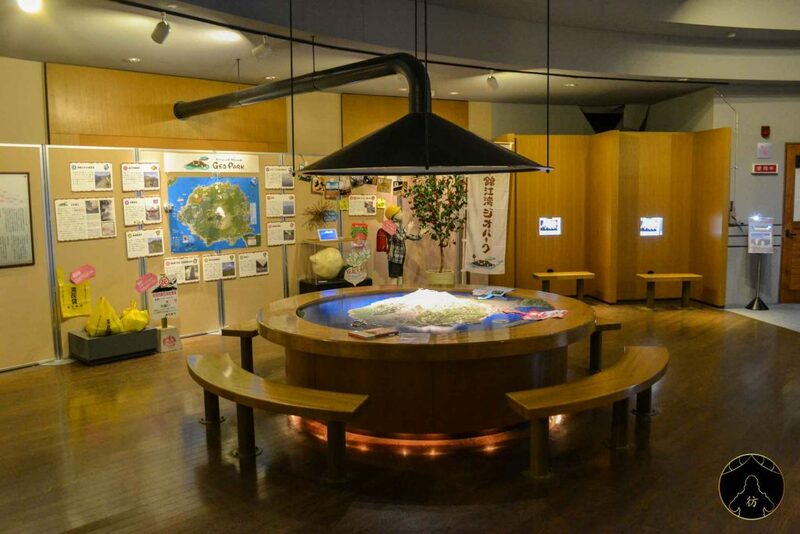 The Visitor Center is like a mini-museum where you can find a lot of information about Sakurajima and its volcano. It’ll make things clear for everyone once and for all: Sakurajima is no longer an island but a peninsula. It’s actually after a violent eruption in 1914 that lava running down the mountain filled up the gap that separated the eastern part of Sakurajima from Kyushu. 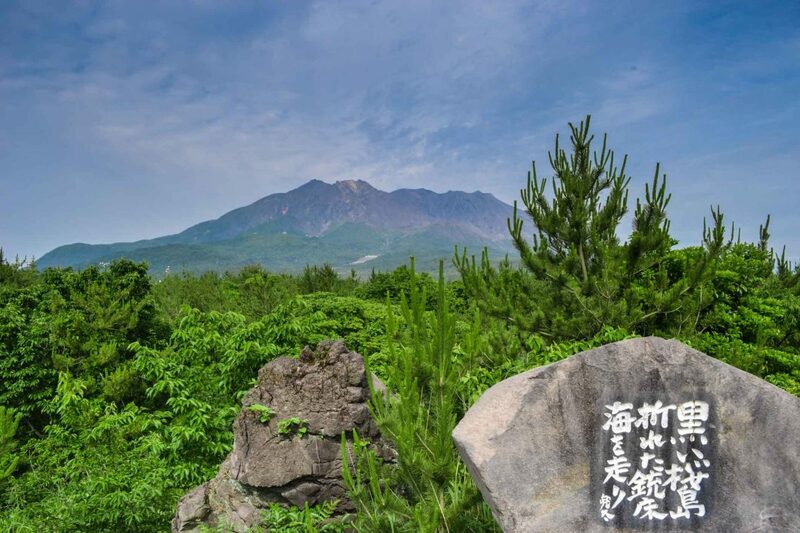 Nevertheless, people still refer to Sakurajima as an island and after 1914, it still bears the same name with the same -jima suffix, meaning ‘island’ in Japanese. 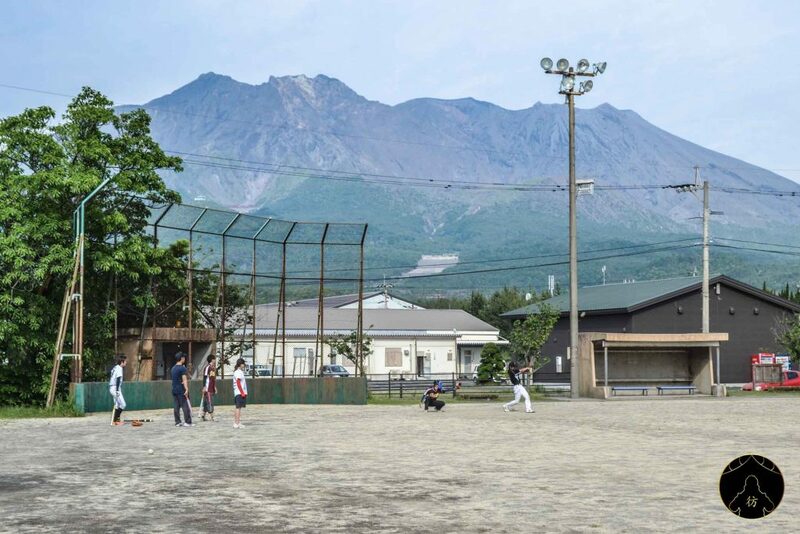 The majority of the attractions I am talking about in this blog post you can visit on foot from the port of Sakurajima. You might feel you need a break at some point so how about sitting down and soaking your tired feet in hot water? 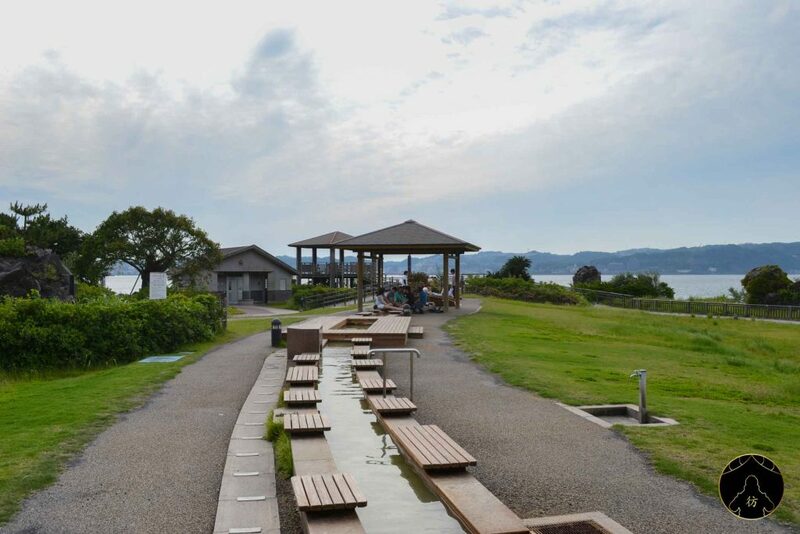 It’s a magical feeling even though it’s such a simple thing to do, and you can do it for free at Kirishima-Kinkowan Park. 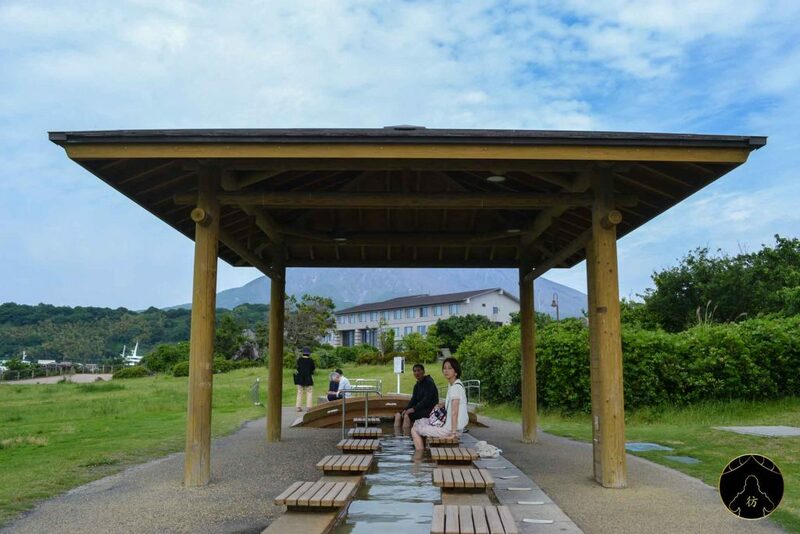 These baths are called ashiyu and the water comes from springs naturally heated by the volcano’s activity. A real treat! 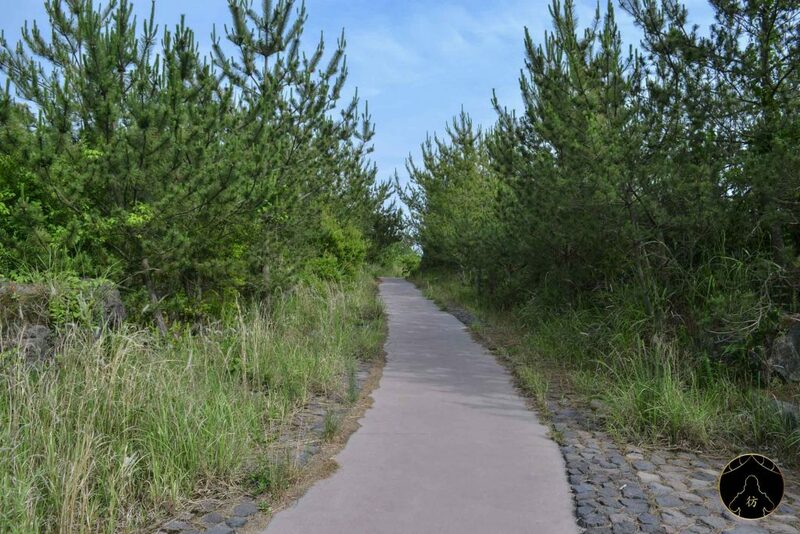 As you leave Kirishima-Kinkowan Park, there’s a trail called Yogan Nagisa. 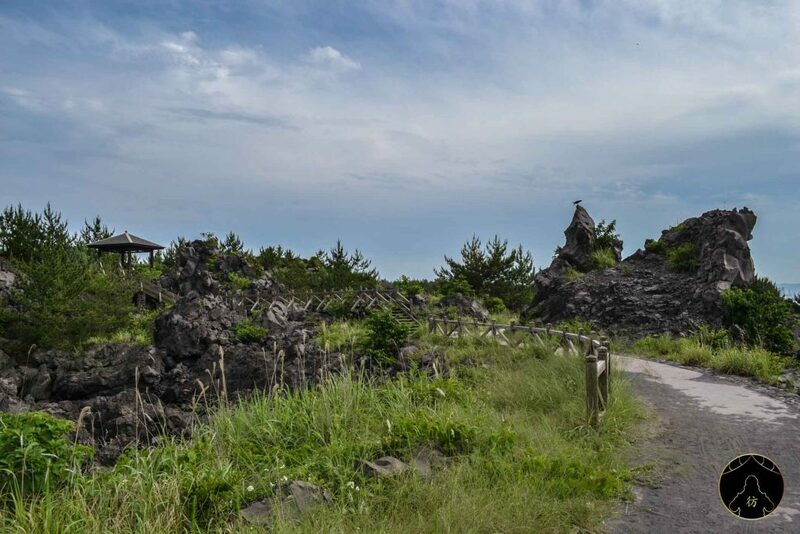 It is actually a half paved trek trail you can follow to enjoy beautiful natural landscapes, black volcanic rocks and a great view of Kagoshima Bay. If you follow the Yogan Nagisa trail towards the south, you will get to the Karasujima’s observation point. If you’re looking for a breathtaking view of the volcano with a beautiful forest in the foreground, you’ve come to the right place. 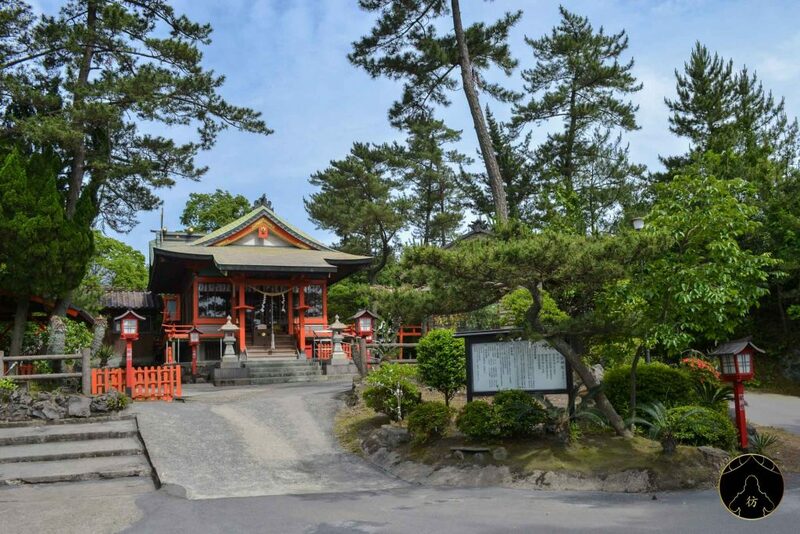 It’s about a 30 minute-walk from the park’s ashiyu. At some point, you will come across this rather strange sculpture. It is supposed to represent a singer surrounded with guitars in reference to a huge rock concert that took place in Sakurajima on the 21st of August, 2004. It was a Tsuyoshi Nagabuchi concert that lasted all night and brought together no less than 75,000 people. For an island of 6,000 inhabitants, that was a lot of people! 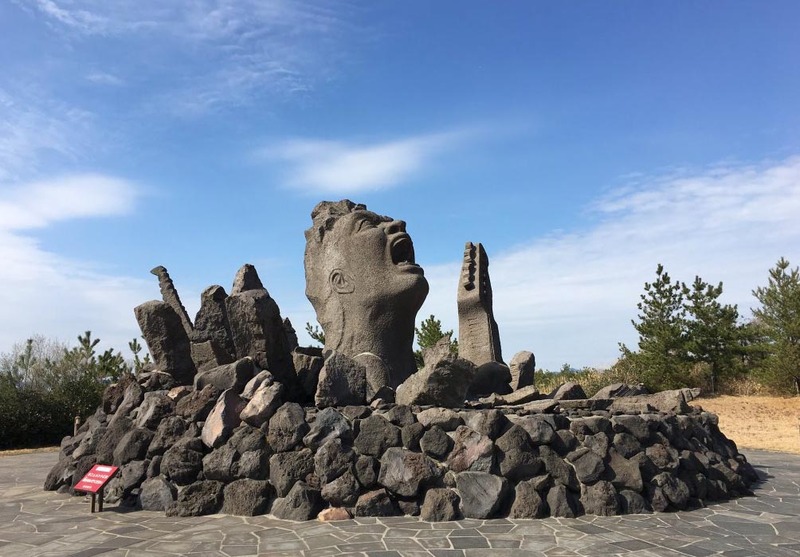 To commemorate this unforgettable concert, a group of fans and associations agreed to build this monument that was inaugurated in 2006 by Tsuyoshi Nagabuchi himself. As you can see in the table below, the bus line is active from 9AM to 4:35PM with a frequency of about one bus per hour. There is actually only one bus that goes back and forth and takes a five minute-break between trips. 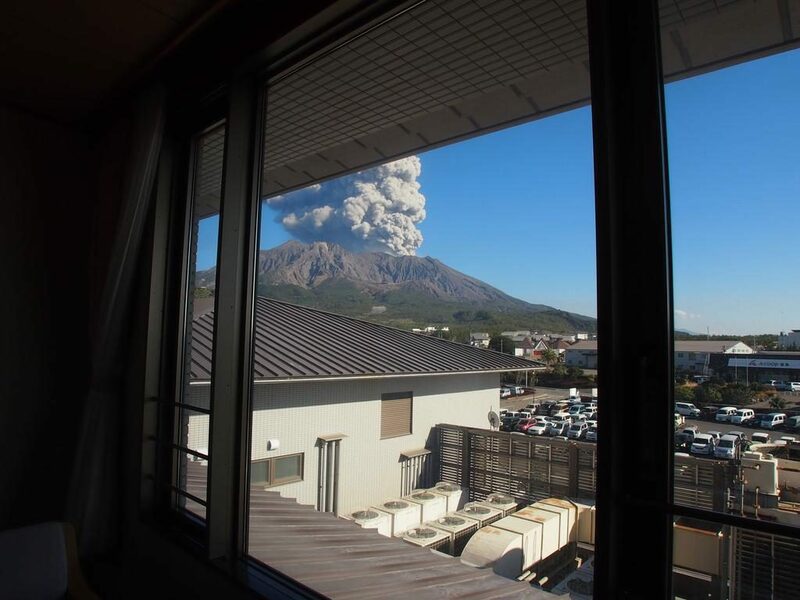 You know all about Sakurajima and its impressive volcano now! Walking back to the port, I came across these guys playing baseball in a surreal setting. My day in Sakurajima ended in music. I went for a drink in a café near the port where I met a singer from Okinawa. He played some of his home’s traditional songs with his three-string Okinawan sanshin guitar. It was great! Thank you all for reading this blog post. Make sure not to miss out on my upcoming adventures in Asia by subscribing to my social media: Facebook Page, Facebook Group, Instagram and Pinterest.